Real name Siyabonga Ntuli , born and bred in Ekangala, Bronkhorstspruit South of Pretoria. 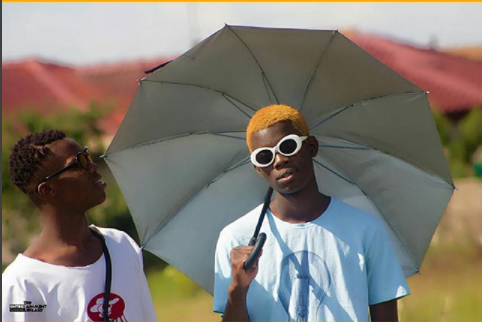 His love for fashion started when Skhothane’s were trending somewhere in 2012, but the love for branded clothing comes way back when his mother came back from England in 2006, she bought him and his cousin a full Nike attire, "man that was the beginning of something great". In the streets his known as "Lvrd Gvrgexus" , I found out from the homie how did the name come about... "That name bro, uhm there is a verse in the bible that says we are Lords and the Gorgeous part I took it from Nokana in 2016 he used to post pics and caption them Gorgeous Boys, so yeah, the X’s and V’s substitute the O in both names"
Lvrd Gvrgexus is a stylist and a hip hop deejay by profession , both jobs are demanding and are for long hours , the Lvrd explained to me how he keeps the balance... " Bro, those are one of the easiest careers to balance mainly bc (because) they don't clash with each other, they really do compliment each other, my DJing gigs are mostly at night and the styling part comes more often in the afternoon". As the culture evolves , more people are getting involved , we have seen a whole lot of kids emerging as creative’s, particularly "stylists" , I had to find out from one , how important is their role in the culture... "I feel like stylist who can actually style are very important to the culture bro , the reason why I say "who can style" is because cats out there cop a fresh pair of vans, a Adidas/kappa tracksuits, a moonbag, thrasher/palace tees and come actually thinking they can style, nah bro, because of that one outfit they think they are stylists now, you cav?". He went to mention how stylists really contribute a lot to the culture, mentioned how Didi Monsta changed Cassper’s look, how Mandisa Mdunge contributed to Distruction Boys phenomenal look. We then later on changed it to Gvrgexus Boyz"
That is the new movement away from Dios. Lvrd Gvrgexus is one of the poster child's for Cap City Street Culture , but looks like a lot of them are moving to Joburg.. "I personally think PTA has its own unique style which is different from what I do, in conclusion I don't think its viable for me, so I would love to move JHB". In the fashion industry , you will hear words like "high end" "street wear" and more recently "luxe" , I found out from Lvrd Gvrgexus what him and his crew at Gvrgexus BOYZ are for?... "l’d say street wear bro, bc you get inspiration from the things around you, people around you and different cultures in the streets. It is also more affordable than High End , High End wont be a new thing to a Sandton boy but trust me street wear will accommodate both upper class and lower class". To close of our convo with the homer, as a stylist he needed to tune me about the hottest trends of autumn/winter 18... He echoed that autumn season can peak a stylist because that's where one has a wide variety of clothes to choose from, but he believes bright colours are back in the game and what’ s Trendy? He say knitted jerseys, keeping it simple. Get in touch with the homer.